An early summer visit to Indian Head Farm in Berlin to pick strawberries or buy asparagus fresh from the field is a tradition for generations of families in Central Massachusetts. Located only a couple miles from one of the region’s biggest shopping malls, the farm is a living link to the area’s agricultural past. Indian Head Farm has been in the Wheeler family for almost 200 years. Tim Wheeler’s great-great-great grandfather, Ephraim, settled there in 1830. Ephraim’s son, Christopher, took over the farm; and after he died during the Civil War, his wife Cordelia and son, Arthur, shared responsibility for the operations. Their cash crops were asparagus and Concord grapes, shipped to Boston by train. In those days there was a station half a mile down the road where trains picked up produce from local farms to supply markets in the city. By the time Tim’s father, Willard, grew up on the 110-acre farm in the 1920s, it had transitioned to a dairy operation; the family raised Guernsey cows. Forty years later, Indian Head evolved again, from dairy farming to supplying hay to horse farms in the vicinity. In the mid-1970s, Willard decided to try his hand at growing asparagus and reintroduced the crop; strawberries and blueberries followed shortly thereafter. Meanwhile, Tim Wheeler had no intention of being a farmer, although after college he worked as an interpreter at the region’s premier rural history museum, Old Sturbridge Village. Tim returned to the family farm and helped his father develop a loyal following among people who enjoy getting into the farm’s fields. “We found that customers have high expectations, but if you grow a good crop, they are willing to pay for it,” he explains. Over the past 30 years, the family added a variety of fruit and vegetables for picking and for sale at a farm stand they operate on the property. 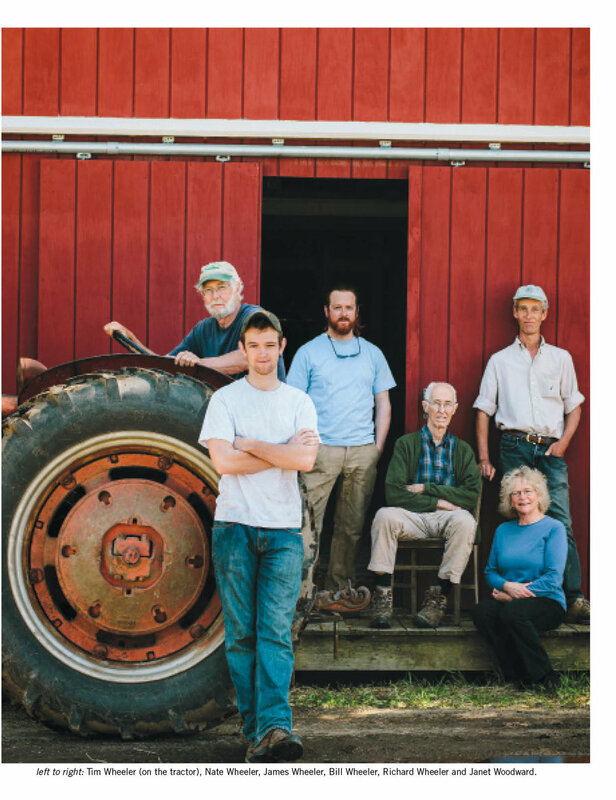 “The way our farm works, you can start in the spring with asparagus and strawberries, move into blueberries, tomatoes, and corn throughout the summer, and squash and pumpkins into the fall. That’s almost six months of fresh fruit and vegetables,” Tim says. Now the family-run operation includes Tim’s wife, Janet Woodward, and their two sons, James and Nate, who represent a 7th generation of Wheelers. James handles all the online marketing, while Nate and Janet are developing a network of local products they will sell throughout the summer at the family’s farm stand. Among the local products they carry are Smith’s Country Cheese from Winchendon, Biga Bread from Charlestown, and eggs from a Berlin neighbor, Lilac Hedge Farm. The family still maintains strong connections to their agricultural ancestry. When bunching the harvested asparagus, for example, they use the same 1880s-era cast iron machine that great-grandfather Arthur used. The farm also has an extended family of about 20 employees, most of them seasonal. They range from high schoolers to retirees. The Blueberry Brigade, a small group of women in their 60s, 70s, and 80s have been picking blueberries in the early morning hours for the past several decades. Tim Wheeler has watched a generation of young, summer employees grow up. “I’ve had some come back and tell me it was the best job they ever had,” he says. One of the farm’s full-time staff has worked there since he was 15. Now in his early 30s, with a degree in agricultural science, “he knows the fields and understands growing and watering patterns. It’s valuable to have continuity like that,” Tim adds. Two other workers have tended flowers in the fields, bunched asparagus, and made jam and muffins in the farm kitchen for decades. Tim is encouraged by the increasing numbers of young people who are starting to farm. “It’s a good time to get into farming; towns are supporting them with tax relief through the 61A program,” he says. He is referring to the state program (Chapter 61A of the General Laws of the Commonwealth) that allows towns to reduce the assessed value of farmland as long as its primary use is agriculture. The Wheelers have participated in the 61A program for over 20 years. Another aspect of farming that hasn’t changed over centuries is the endless battle against harmful insects and plant diseases. In the early 1800s, this area was known for growing hops, but aphids and downy mildew wiped them out. Today, the Wheelers’ first line of defense against infestation is a system of integrated crop management. The crop specialist program originally was launched by the University of Massachusetts’ Extension Services; the program now operates independently. Last year, local farmers battled the spotted wing drosophila, a new species of fruit fly that targets soft fruit such as berries as well as peaches and sometimes tomatoes. Four years ago the Wheelers began extending the season for salad greens and tomatoes, planting in a high tunnel greenhouse built with the assistance of a grant from the USDA. Last year the Wheelers rented two more greenhouses off the farm site. There, Tim’s brother, Richard, raises flowers and plants and sells them at Indian Head’s newest greenhouse. The corn heater is similar to a pellet stove. “It gives amazing heat and leaves a carbon footprint that’s neutral. It also cut our fuel bill by 40%,” Tim says. Another major challenge in running a farm today is diversifying. “As a small farm, you can’t afford to specialize, and as a result, you wear more hats than you would in other businesses,” says Tim. The Wheelers have supplemented the farm’s income with income generating projects on other land they own. They are leasing 23 acres to Sun Edison of New Jersey for a solar farm. In recent years Indian Head Farm has introduced a variation of a CSA. Their customers can purchase full or half shares at a 5% discount if they buy before April 15. In return, they receive a gift card valued at $400 (for a full share) or $200 (for a half share). The card can be used to pay for pick-your-own products or anything sold at the stand. “It gives us a revenue stream in April when we’re making our big seed and fertilizer purchases and helps with the cash flow,” Tim says. Tim’s wife, Janet is pursuing value added options with plans for a commercial kitchen and the addition of pickles to the line of homemade jams and jellies that are sold at the farm store. The farm is raising its profile in the community with a variety of outreach activities. There was an open house the first weekend in May and a series of gardening classes are planned for later in summer. Last fall, Indian Head Farm was the site of a pumpkin toss—with a trebuchet built by family and friends—to raise money for the local historical society. Now there are new pumpkins growing in the field where the catapult still stands, a rustic link to the past on a farm rich in its own history.